Annual California International Flower Show, featuring flower show princesses in native costume and award winning exhibitions, at Hollywood Park in Inglewood, California, March 7, 1956. Also includes Miss Japan winner Pauline Taeko Higurashi holding bouquet of peach blossoms with participants Yasuko Ideishi and Caro Miyeko Sugano at Olive Hill at Barnsdale Park. 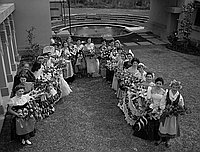 Typed on original negative envelope: International Flower Show -- Princess Selection.